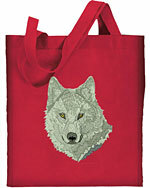 Enviromentally friendly Tote Bag with Grey Wolf High Definition Embroidery Portrait #2. The 100% cotton canvas tote bag is a great replacement for the plastic bags. We mail these items usually within 3-6 days, depending on the options you choose. The NATURAL color totes are sewn with black embroidery. The dark COLORED ones with white embroidery. You have the option to put names, or other CUSTOM TEXT above and/or below the embroidery. Please choose Tote Color from the dropdown list. The Font Style you select will be applied to all the custom text you order.